Yoga is the only way to build flexibility and there are about 15-16 brilliant yoga asanas that can lead to building flexibility in the most inflexible bodies. The irony is that people avoid yoga because they aren’t flexible enough – But that exactly the reason to get into Yoga ( read here for some lifetime benefits). Why we need flexibility – To have our joints work in the most smooth manner for the longest possible age and stay injury free. 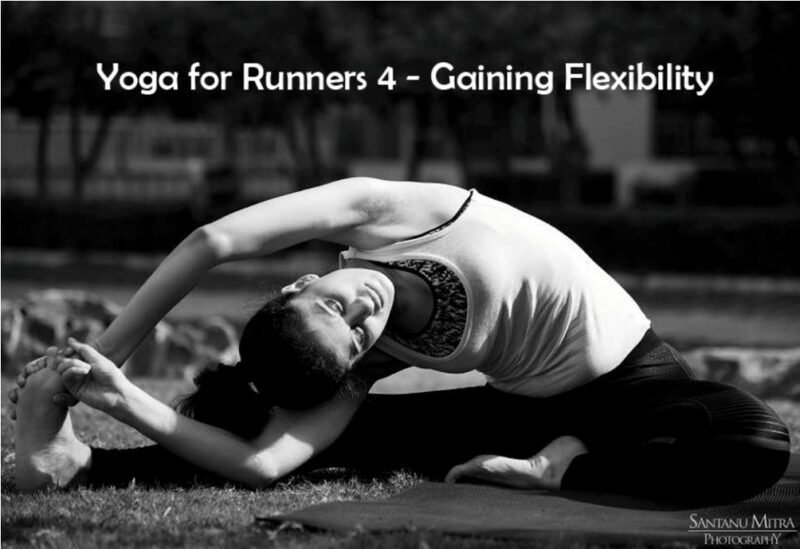 Why runners need flexibility? Or a better way of making this question effective is what does flexibility do to a runners’ running? Flexibility gives us runners a wide range of motion. and removes soreness from hamstrings, quads, calves and all of lower body, keeping injuries at bay too. There are three major muscles groups where most people lack flexibility: hamstrings, hips, and shoulders and unfortunately, these three areas get even more tight from sitting for long periods and with exercises like running. The downward dog gets tough because your heels probably don’t touch the floor. Stand a few feet in front of a wall and place hands flat against it a bit above waist height. You have to walk your feet back and continue to straighten out arms. Don’t arch your back. And keep your gaze down. Lengthen your spine and don’t crouch. It brings great flexibility into the spine and opens up the calves and hamstrings. Gradually as your develop flexibility in weeks or months, you move to the downward dog position because it improves the flexibility of commonly tight lower-body muscles. It majorly helps in improving the range of motion. It’s not easy to touch the hands and the palms down on the floor and hence for beginners it is suggested to use a block. . And try to use the block in various ways as shown in the images. Increases back and hamstring flexibility. What is not to be forgotten is to exhale as you go down and lengthen the spine while going down. The lengthening should come starting from the back of the foot, to the calves, the hips and then the spine. Keep the block in various ways and again gradually try to touch your hands down. The final aim of this pose is to be able to give you flexibility in your spine again. It is said, you are only as young as the flexibility of your spine! Place a chair next to a wall and bend the leg touching the wall and place it on the chair. As you twist and look back, place your hands on the wall and twist as much as you can while keeping the shoulders relaxed, breathing in and out. Every time you inhale you lengthen the spine and at the exhale you twist a little more. Keep the shoulders soft and feet nicely grounded. Repeat on the opposite side. Inflexible bodies have a hard time doing this pose. But you don’t have to go the whole hog by holding hands in the first go. Use a belt or a cotton belt and gradually and progress it will take you to the full pose. It takes a while for the hands to meet. In this one the progress to the full pose will be slow. It stretches every muscle of the shoulder. The hip muscles also get a great stretch. This is for creating that free spirit in the lower body. Lots of stiff yoga beginners get really scared watching the full pose. Trying is even harder. But then as Yoga would have it, you need to progress slowly and steadily. Use a belt to help you move forward. Remember to lengthen your spine and not crouch.Shoulders to be kept really soft. The stiff shoulders won’t help you get too far. Remember to breathe out as you reach for your toes. These yoga asanas will give you both flexibility and fitness. Don’t be in a rush, all good things take time and practice daily! Superb. I can so relate to this being an inflexible runner! Nicely put all together Tanya..
All the above mentioned exercises are good i hope but bending is pain and how many days or months or years it may take to achieve the target ? Appreciate the effort for putting great posts . Absolutely right in pointing that runners are ignorant about flexibility . I have found that encouraging them to take a squat or touching the toes is an eye opener . Hey, thanks for the band suggestion on Gomukha Asana. I used to it so very well in 1980 when yoga had cured my asthma. I know I get so damn frustrated not being able to be half there. The band will get me there. Most of the standing stretches are a part of a runner’s post run stretching, though. I do a Thahrav Surya Namaskar post run, where I hold each pose for 30 seconds. Also helps me avoid a wheeze which sets in if I do regular paced Surya Namaskars. As I said earlier, I do carry an impression that runners ain’t that flexible as a genre. That’s because in the ‘Expo’ of the first ever RnL Full Marathon in Gurgaon (22/2/09), we were all made to do some Yoga stretches and realized how stiff we all are, especially in the bending ones. I saw this today when it was boosted in facebook. Thank you for sharing this details.